What is a Pennsylvania Quit Claim Deed? Pennsylvania Quit Claim Deed: What Is It? A quit claim deed in the state of Pennsylvania is a legal document that allows a Grantor (the seller of a property) to transfer his or her ownership rights to a Grantee (the buyer). This type of transfer comes with no guarantee that the seller has the legal authority to sell the property, but instead, expeditiously transfers the owner’s rights to the buyer. However, along with the ownership rights, comes risk. Quit claim deeds do not protect a seller from any issues with the title of the property. Because of this risk, it is important that the buyer conduct a thorough title search to ensure there are no unpleasant surprises. Recording - All quit claim deeds filed in the state of Pennsylvania must be filed with the County Recorders Office in the county where the property is located. Certificate of Residency - All new owners of real estate must submit this document. 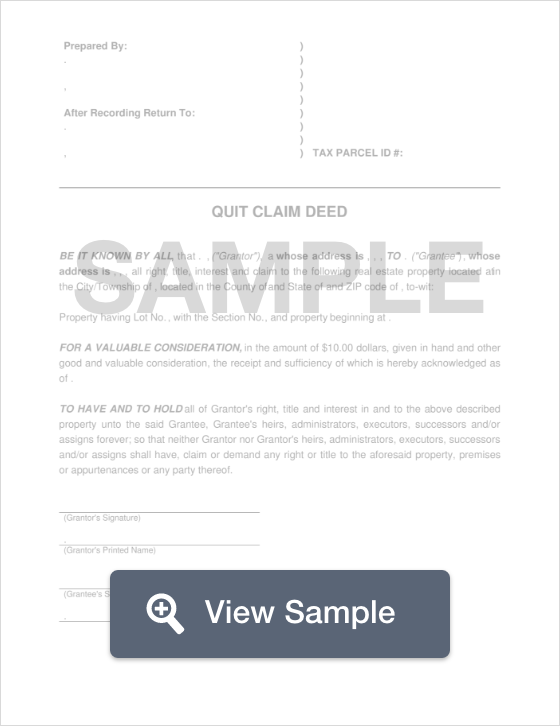 Uniform Parcel Identifier Stamp - this stamp is placed on the quit claim deed after the property transfer taxes are paid.